Finally, I have my triangle quilt photographed and ready to show off! I finished this one over a month ago, but couldn't bribe anyone to help me take the pictures and finally my husband agreed. You would think I was asking for a kidney. Good grief. This quilt was started as part of The Triangle Quilt along hosted by The Sassy Quilter. i joined in around mid-March, and followed along pretty well, except when it came time for the final link up. I didn't have my binding finished, I missed the deadline by one day. Thankfully, Paula held a special late-finishers link up, and that is what I will be linking up to today. This quilt was made with the fabric line, Indian Summer by Sarah Watson for Art Gallery fabrics. I love this line, it is just "so me!" I added in various solids and the peach that I used for the "background" was one of the cross-hatching prints from Carolyn Friedlander's Architextures line of fabrics. I designed a very distinct pattern for my triangles, the smaller measuring around 5" and the large triangles measuring around 10". You can read more about the process HERE. The finished quilt measures 40" x 48" a wall hanging that I will hang in my living room. I decided early on that I wanted to straight line quilt this one, but I wasn't sure exactly how I wanted the lines to go. In the end I decided on a "large arrow" quilt pattern and then radiating the lines from there. I used my Juki TL-2010 with the walking foot and a 40 weight white Aurifil (and a 100% cotton Pellon batting.) The lines are quilted in a pattern, 2 at 3/4" apart, then a 1/2" space. The 1/2" space falls in the center of the "arrow" triangles. I am happy with the simple quilting, it highlights the triangles but doesn't distract. I decided to do a matched angled binding per the tutorial found at A Quilter's Table, HERE. Even though this technique really isn't hard (and creates a fantastic look) I struggled so much with this technique. I swear I worked on the binding longer than I did the whole quilt process. In the end I had messed up so much, I only had enough fabric to match the top and bottoms, and just bound the sides with the Architextures print. I did carry around the matched binding on the bottom corners, which you can see above, and I am really happy that I did, I love that little detail. Once again, I used my trusty Heather Ross Crafty Chloe from Hancock Fabrics print as the backing. I love that print and wished I had bought more, as now I'm running low. I also am thrilled with quilts that can use a single cut of fabric for the backing, so simple and makes the whole process so much easier. This quilt is so soft and has such a nice hand to it, thanks to the Art Gallery prints. Honestly my kids have been playing with it for the last month, so it might be time to wash it before I hang it up, which I am really eager to do, being that the "Indian Summer" is almost upon us! Thanks to Paula for hosting such a fun quilt along! A month and a half ago, I had the pleasure to share my Lotus quilt over at Sew Sweetness as part of the Jaybird Quilts Sew Along, it was such a fun quilt to make and after it was finished I was just itching to make another one of Julie's patterns. They really are great y'all. Well I quickly figured out the next pattern I wanted to make after seeing Debbie's version of Northern Lights. Oh so pretty! So I ordered the Northern Lights pattern (I already had the Hex N More ruler) and I ordered this gorgeous fabric (Shimmer) by Jennifer Sampou. I quickly got to work! I decided to make the Baby sized quilt, I ordered seven different fabrics, so I only had to figure out which one to eliminate. Well as you can see, in the end I was unable to eliminate one and instead decided to use them all! So in order to use them all, I added another row to the width, and two extra rows to the length. Thus my quilt ended up being right in between the Baby size and Lap size, measuring 44" x 56." The great thing about this pattern is how easy it is to customize to get just the right size. I intend for this quilt to be a wall hanging in my house and honestly this is probably the most elegant thing I have ever sewn. Very subdued for me, usually I am all bright and crazy, so this is really a step out of my comfort zone. Now you can't really tell in these photos, but the fabric is named "Shimmer" for a reason, it has just a slight touch of metallic accents or shimmer to them. They are gorgeous! Really stunning. and I hate the fact that you just can't appreciate it unless you see these in person. The print in the very center, the lightest one, is my absolute favorite, in a way it reminds me of a snake skin, but it is just so darn perfect! I chose to arrange the fabrics from dark to light back to dark and also to separate the two different colorways. I was hoping for a smooth transition, and I am really pleased with the result. This quilt top was cut out and sewn in about a day, which is also one of the things I love about Jaybird Quilts patterns, so fast and it packs such a visual punch. I had hoped to have it quilted by now (I already have my thread) but am struggling to find the perfect backing and honestly don't want to just settle to have it finished. So that being said, I took it outside this morning for a quick photo shoot and for now we will have to enjoy it as just a quilt top. I plan to matchstick quilt this one via She Can Quilt inspiration, but not all over, rather in a very deliberate pattern, I think it will be awesome, or at least I hope it will be! It looks great in my head! I am linking up this quilt with the Jaybird Quilts Sew Along. It was really fun to be part of the Blog Hop, and then turn around, sew another quilt and be able to link it up! If you get a chance, head over to the link up and check out the other entries, there are some fabulous projects over there! Thank you to both Sara at Sew Sweetness for holding such a fun Sew Along and for Julie at Jaybird Quilts for designing such awesome patterns and rulers! Welcome to Marci Girl Designs! If you are here for the first time from Blogger's Quilt Festival, I would love for you to have a look around. I am a stay at home mom to two precious boys and I fill all my free time with all forms of sewing, and in the last few years, mostly quilting. I'm pretty obsessed, but anyways, enough about me, let's talk about this quilt! 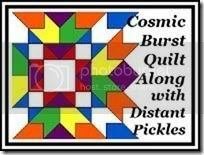 This is my Cosmic Burst quilt that was part of two sew alongs that took place a few years ago. It started with the Cosmic Burst Quilt Along hosted by Distant Pickles and then I chose to use "my precious" fabrics and incorporated the My Precious Quilt Along hosted by Kelby Sews. Way back in the day when this quilt was started, I worked pretty diligently on it and had the quilt top finished in a semi-timely manner (good for me anyway.) In typical fashion, once the quilt top was finished, it sat for a long time, probably a year. Well at the beginning of last year (think last March) I finally basted, quilted and bound it. I even took pictures back then, but NEVER blogged about it. I have no idea why I never blogged about it, I ADORE this quilt, it is currently hanging in my living room and I love it, I guess I just never sat down to share this beauty. Well today is the day and I decided to share it today by participating in the Blogger's Quilt Festival! I said before that this quilt started with the Cosmic Burst Quilt Along, so the pattern was chosen from the very beginning, I knew what the overall quilt design was based on this awesome pattern that Julie designed. I still love it today as much as I did when I started this project. Such a pretty design. I then had to choose what fabrics I wanted to use to compliment the pattern. Well I knew I wanted something pretty special, so i chose to cut up my hoarded, precious Heather Ross, Macaroni Love Story that was printed exclusively for Spoonflower. I created 3 digital mock-ups of fabric placement (I didn't want to mess this thing up) and after debating for a while, chose the one I liked best. In the end I added in Patty Young, Lush, Running Stitch (the pink and orange dotted stripes) and then framed the whole thing with a background fabric of Alexander Henry Heath (the gray crosshatch,) still one of my all time favorites. I had to do quite a bit of figuring to get all of the directional prints to fall perfectly, especially those blue and yellow sail boats, that was a mental challenge! But once the cutting was done, the sewing was fast and before I knew it I had a finished quilt top. And there it sat forever. Well in the meantime Heather Ross designed fabric for Hancock Fabric stores, one of the prints was a matching clothespin doll print in gray (which worked out PERFECTLY) and I was able to buy enough yardage for the back of this precious quilt that featured all of these much loved and hoarded fabrics. So I basted it, and then had to decide on quilting. I pretty much knew that I would straight line quilt this one, and I wanted to feature the radiance of that center star from which the whole quilt pattern was based. I started quilting on the diagonal in 1/2" lines from corner to corner and then the opposite direction, this creating the wonderful grid right in the dead center of this quilt, seen below. I just loved how that turned out. Oh and I used a nice matching gray quilting thread, to hopefully blend in, but yet be seen just the right amount. Once the center sections were quilted, I just echoed the quilting in diagonal "triangles" in the top, bottom and sides. I chose to do this stitching 3/4" apart, hoping it would make the center section stand out, and I think it did exactly what I was intending! Once the quilting was complete I decided to bind it in the same Alexander Henry Heath, so that the binding would just blend into the background. The finished quilt measures 40" x 40", I used a cotton batting (don't remember the details) and it is a perfect wall hanging. I am so happy to have shared this finished quilt today and thanks so much for reading along! I also wanted to mention that I am fairly new to Instagram, and I would love it if you would follow along with my daily antics, you can find my Instagram account here, marci_girl. We have reached the point where we sew all the rows together and trim it up. So here I am with a finished quilt top! It measures 41" x 48" and will be a wall hanging in my house. I plan to do some simple straight line quilting, and I just ordered some more basting pins (I ran out and actually they were delivered yesterday) so I plan to baste it up soon and get to quilting. The fabrics in this quilt are Indian Summer by Sarah Watson, the peach is Carolyn Friedlander's Architextures and some solids, both Art Gallery and Kona. I included the photo below because of the little guy in red all the way to the right. He cracks me up back there, down the trail. Anyways, quite a few have linked up their finished quilt tops, so hop on over and have a look at the diverse selection of quilts, because I promise, they are all really different! Week two of the Triangle Quilt Along hosted by The Sassy Quilter. I've said it before, but apparently I can not follow directions. I'm changing up the design (big surprise!) Be it that I am using fat eighths, the tutorial called for 6" triangles, I had to reduce that to 5" triangles in order to cut enough from my fabric, so my quilt will be a tad bit smaller. No big deal. Then I decided on a very distinct plan of how I will layout these said triangles, thus I have the larger 10" ones as well that will be worked into the design. Wish me luck! I'm flying by the seat of my pants here! This is the project I have been working on this week, so I'm also linking up to Sewjo Saturday hosted byMy Go-Go Life! I decided to jump into a quilt along today! Yep, just dove right on in there! It is the triangle quilt along hosted by The Sassy Quilter. You see if you really think about the majority of quilts that I have made and actually finished, at least three of them have been triangle quilts. I kinda love making them, actually I think it is my favorite type of quilt to make! This one will be a 60 degree (equilateral) triangle quilt made using the fabric line Indian Summer by Sarah Watson. I am going to add in some solids to break up the prints (probably) but am not certain yet. I guess once I dig through my solids, then I will decide if anything I have matches or not! The quilt along has just started, week one in fact, so if you want to dive in too, go ahead, all you need to do the first week is pick out your fabrics and officially sign up! Click on the button below to get all of the details! The Two in One Tote, two challenges, one tote! It all started last year when I joined the Modern Quilt Guild as an individual member. How exciting to be able to have that opportunity, I was and am thrilled. The first thing that I loved about being a member was that now I could participate in the fabric challenges that I had seen so many groups participating in. So here is the very first, The Riley Blake Challenge. The guild sent all those who signed up 6 fat eighths of Riley Blake fabric and we could make whatever we wanted, just so long as it was quilted. We could add any solids, or any Riley Blake fabrics. Right from the start I new I wanted to make a beach bag. We need a new one desperately. The old one was skin chaffing and just all around terrible. Even though I knew I wanted to make a tote, I really had no idea on what to do with the fabric, or how far the fat eighths would really go on a large tote. So there the fabric sat for quite some time, and then the Guild extended the competition and therefore my fabric sat even longer. 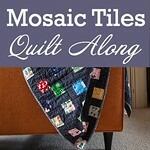 At the beginning of the year, while blog surfing I came across a blog post from Craft Buds announcing theMosaic Tiles Quilt Along. Oh, now there is an idea. So I ordered the book, Modern Bee by Lindsay Conner, and once it arrived, a plan was formed. The Mosaic Tiles block is a 11.5" x 11.5" block, and I roughly figured that if I made four blocks, that would be right around the right size for my tote (or one side of it at least.) The Riley Blake Challenge included the dark gray solid, so I added in two coordinating shades of gray and set to making the blocks. I purposely arranged the layout, the grays in diagonal lines, and then the prints just random. Once I had the four blocks completed and sewn together, I attached the panel to fusible fleece and quilted with a medium gray 1/4" away from the seams with my walking foot. I loved it, the only problem was that I didn't have enough fabric, solid or print to have a matching second side. So now what? I started with taking the prints that I had left and cutting out 18 - 4.5" x 4.5" squares, leaving only a 3" x 9" piece of fabric left. I randomly sewed these together, creating a small panel the same width as the front, but quite a bit shy of being tall enough. I pondered for a while and thought of my intended purpose of the bag, a beach bag and decided to try a modern applique beach wave. Any why not add in a little ombre too? I dug through my stash found 3 coordinating blues, and drew up a wave template. I didn't want to use raw edge applique, so I put two layers of the dark blue together, traced my template and sewed on the line in a short 1.5 stitch. I then cut with my pinking shears close to the seam, cut a few notches, then turned the fabric. After fidgeting with it a bit, I then Ironed the HECK out of it and created a smooth-ish wave that contained no raw edges on the exterior. I then machine stitched this wave on top of the patchwork panel about 1/8" away from the edge. Now that the hard part was done, I added the two blue solids and now I had a second finished panel. I also fused this side to fusible fleece and then was faced with how to quilt it. I knew that I didn't want to repeat the straight line quilting, and wanted a totally different look for this side. I decided that the patchwork colorful part reminded me of the umbrellas and people on the beach, so I free motion quilted the circle "umbrellas" on the "beach." Then I knew I had to echo the waves onto the beach a bit and of course in the water. I used my walking foot to quilt the waves, which I guess? was the most accurate way to do it? Maybe if I was super skilled I could have free motion quilted it, but I don't that at this point my skills are quite that good. The only problem I ran into during this whole process was when I had to free motion quilt the circles. The first and second round went fine, but when I made the third and fourth loop of stitching the fabric really pulled in and distorted, creating a "bubble" of sorts in the center of the circle. I know that the problem was probably caused because I didn't have enough layers and was only quilting through cotton and fleece. I ironed the HECK out of that section, but in the end, it definitely has texture. Now that my quilting was complete, I found a matching gray solid for the lining, and started to assemble the bag. I stitched the sides and bottom. Created a gusset, and was overall pleased with the size and shape. it really was just right. Just big enough to hold several beach towels, a few toys and such, but not too big. When it came time to sew the lining and the bag together, at the last moment I decided to add piping to the top edge, just to add a little extra touch. I am really glad that I did, it really separates the exterior from the interior. This bag is pretty floppy, does not stand on its own, but that is exactly what I wanted, because when it is time to travel and store it, I can just roll it up and tuck it out of the way! The plan all along was to have rope handles, I mean you can't have a beach bag without rope handles, right? So once the bag was all sewn, I installed 4 silver grommets that had a 1/2" hole opening. Now I just needed to go to the local hardware store for some rope. I ended up buying a 3/8" natural sisal. It slipped perfectly through the grommets, I tied knots on each end and it was just the right size. Now I complained earlier about my old beach bag chaffing our skin, so of course I couldn't have the rope raw against our bare shoulders. I looked at the scraps I had left, took the 3" x 9" pieces, cut it down to 2.5" x 9" and created lined tubes that slipped onto the rope, nice and slim little handle covers. My bag was now complete! It measures 20.5" wide, 18" tall and an 8" gusset, and a 12" handle drop. It is LARGE! I really enjoyed the process, the finished tote and being able to participate in two challenges, simultaneously. Thank you Riley Blake for providing the fabric, and for the Modern Quilt Guild to host this challenge. Also, thank you toCraft Buds for hosting the Mosaic Tiles Quilt Along, because honestly, that side of the tote is my favorite, and in my opinion the most modern! I almost forgot, but this is also my first finish in the first quarter of the 2014 Finish Along hosted by Katy at The Littlest Thistle!